Working on cash flow management to move a business from operating in the red to operating in the black can be an uphill battle for many companies. The good news is it doesn’t have to be a battle at all. 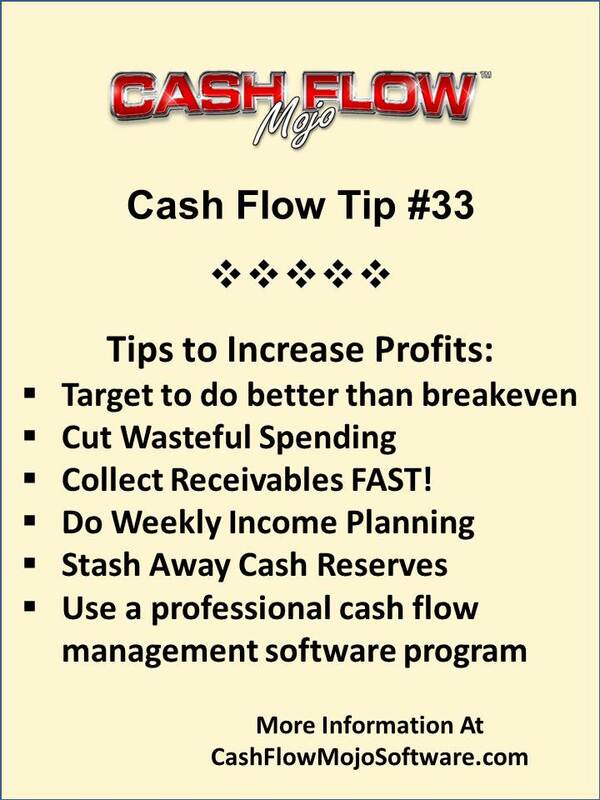 There is a solution to simple cash flow management to increase profits and avoid cash shortfalls. Here are 7 tips to help you out. Knowing your breakeven point is important, but why work just to pay bills and have no profits? Planning to do better than breaking even is what makes profits possible. Turning your budget into an income planning target that can send profits to the bottom line only takes adding line items for savings and future anticipated expenses to the budget. Under-estimating the amount of income you need to be profitable is deadly. All businesses waste money at times. Stopping or controlling the waste so profits can get to the bottom line is a good tactic. Waste is spending on what is wanted, but not necessarily needed. Some of the places to look for wasteful over-spending are in the categories of office supplies, travel, meals and entertainment. There are some items that are necessary, but are never looked at as a place to cut costs. One example is auto insurance: as premiums rise the business owner often just accepts it and fails to shop around for less expensive rates for the same or better coverage. Over-spending on inventory purchases can be a profit reducer too. Buying so much inventory that some of it becomes stale-dated or unpopular based on newer trends can leave a company sitting on unsalable merchandise. Likewise buying inventory over and above your cash income budget allocation puts the company in a position of using credit debt, and that just creates another “bill” that pledges your future income to pay it off when that future income will be needed for other bills like payroll or utilities. Receivables that remain uncollected after the first 30 days of being due, become harder to collect as the weeks roll by. That means you risk losing the profits more and more as the days roll by. Put financial policies in place to raise your collection rates on receivables, and don’t hesitate to use a good collection company that charges a fair price for collecting receivables for you and doesn’t burn the bridge between you and your clients. One of the primary purposes of building a budget to do better than just breaking even is to get an accurate Income Planning Target. The budget tells you how much income you have to bring in. Income planning is working out who is going to sell what to bring in the necessary sales each week. Doing this on a weekly basis is best. Everyone tends to freeze up when the target seems like it is an unrealistic reach, and huge numbers cause people to freeze up. A sales team that hears they are expected to sell $37,500 in goods and services this week (as a team) are likely to respond more positively than if they are told they have to sell $150,000 this month. Depending on the team, big numbers can scare people. There are times when your business will experience cash shortfalls, need cash for emergencies, for paying taxes, for unexpected legal needs, need cash for business expansion, and reserves for retirement plans. In reference back to number 1 above, it is smart to budget for these items just like you would budget for any other regular “bill” that has to be paid. Stashing small amounts of cash on a weekly basis earmarked for these items is relatively painless and gives you a cushion of cash to fall back on, and safeguards the company’s profitability. You all know that it is easier to accomplish something more quickly and efficiently if you have the right tools. Who would want to dig a ditch with a spoon instead of with a shovel, or better yet, a backhoe, right? 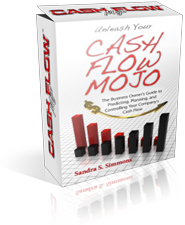 Using a professional cash flow management software tool, like the Cash Flow Mojo® software can help you manage your cash flow efficiently and cost effectively. You don’t have to have a lot of financial knowledge or accounting experience to easily use this software because it gives you a step-by-step roadmap on exactly how to allocate your weekly cash income to increase your income and profits. 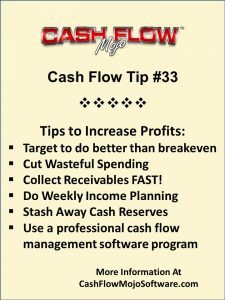 Working in the software to do the complete cash flow management cycle only takes about 30 minutes a week and it takes all the guesswork out of what you should do with your income. Using it is one of the best investments you can make for yourself and your company’s profitability and future financial security. Having the right software is like having the right backhoe; it makes short, efficient work of the job on managing your cash flow to keep your cash flow and increase profits.